Peder Anker, Louise Harpman, Mitchell Joachim, Global Design: Elsewhere Envisioned (Munich: Prestel, 2014). This book examines the possibilities for scaling design solutions to address global warming. Global warming poses new challenges to the architecture, landscape architecture, and urban design communities. The immediate response has been a turn toward a host of energy-saving technologies. What has rarely been addressed, however, is the problem of scale. How can designers make sure that global solutions do not come at the expense of local cultures and environments? 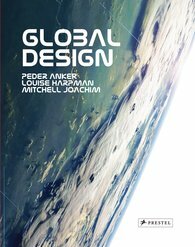 By placing human rational, emotional, technological, and social needs at the center of our environmental concerns, this book proposes a new global design initiative. The aim is to develop a language of design that can create proximity between individual responsibility and the current global environmental crisis. These featured projects showcase leading-edge design innovations at multiple scales. Global Design directors Peder Anker, Louise Harpman, and Mitchell Joachim discuss various ways in which design can reformat the unfortunate separation between humans and the natural world. Shaunacy Ferro, “7 Ways Architecture Can Tackle Global Warming” at FastCompany, Feb. 2015. Entry filed under: Books, Home, News. My review of The Silwood Circle	NYU Supports Climate Deal Now!